This morning in Cupertino, Apple announced its new lineup of MacBook Pro laptops. Coming after the big announcements from Microsoft yesterday, Apple’s new MacBook Pro unveiling might seem a little disappointing to some. When it comes down to it, these new MacBook Pros won’t be convincing Windows users to switch over, but Apple does have some interesting ideas about the future of laptops. The Touch Bar is Apple’s answer to the touchscreen laptop. Steve Jobs famously always hated the idea of a touchscreen laptop, it’s taken a while for Apple to engineer its answer to the problem. The Touch Bar is a touchscreen bar at the top of the keyboard that replaces the row of function keys. When you open up an app, the Touch Bar will change and give you different menu buttons and setting wheels that are context-sensitive to the app. It includes Touch ID on the side and even lets you customize the basic functions buttons. It might not seem as full-featured as having a full touchscreen display, but the quick accessibility of them just might end up being more useful in the end. It’s important to note that Apple is also selling an alternate version of the 13-inch MacBook Pro that doesn’t have the aforementioned Touch Bar. It comes in a bit cheaper at $1499 and doesn’t have the Core i7 option. 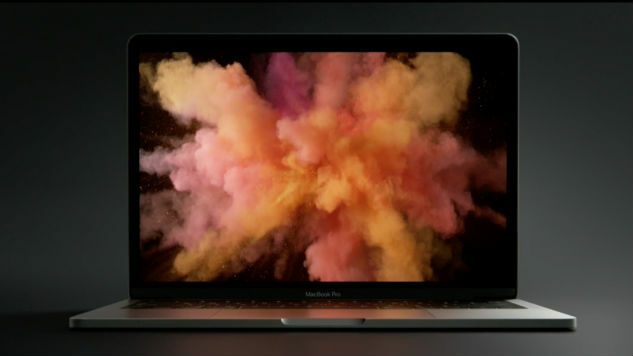 As we expected, the MacBook Pro is lighter and thinner than previous versions of the laptop. The 15-inch version comes in at 15.5 mm, weighs 4 pounds, and is 20% smaller than the previous model. Meanwhile, the 13-inch model is thinner at 14.9 mm, weighs only 3 pounds, and is 23% smaller in volume. In comparison, the 12-inch MacBook weighs only 2 pounds and comes in at 12.7 mm thick. All in all, these aren’t the thinnest laptops in the world anymore, but 14.9 mm is nothing to snuff at. One of the more controversial changes to the new MacBook Pro is the simplification of the ports. Gone are the USB ports, the MagSafe power, the HDMI port, and the SD Card slot. Instead, Apple is giving us four Thunderbolt 3 ports, which can be used interchangeably for different functions. The good news is that Thunderbolt 3 is super fast and powerful (and that Apple kept the headphone jack around). The bad news is that you’ll find yourself purchasing a bunch of different dongles and adapters. Apple has been known for neglecting their power users in the past ten years—and the new MacBook Pro isn’t exactly going to change those feelings. However, the new MacBook Pro does have enough power to make most users happy. The 15-inch version is obviously the heaviest hitter, as has always been tradition. You’ve got the 6th generation quadcore Core i7 option in the 15-inch version, while the 13-inch version has a dualcore Core i5 and i7 option. The 15-inch version also has an integrated AMD Radeon Pro graphics chip with up to 4GB of VRAM. The 13-inch version uses an Intel Iris graphics chip with up to 64MB of eDRAM. This might not seem like the biggest deal in the world, but the Touchpad is now twice as big as it was before. Twice as big! That’s a huge difference, especially when you consider that MacBooks already had bigger trackpads than most other laptops. Having a large, responsive Touchpad is so important when so much of what we do these days involves multitouch gestures.